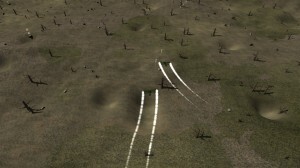 Biplane dogfighting game set in the scene of World War I battlefields. Written in Java using jMonkeyEngine3. Intended as a multiplayer dogfighting game with simplified mechanics, easy to play in short bursts of time. Status: core is done, needs polishing and either AI or reliable multiplayer system.